One of the biggest, baddest SUVs in production, Mercedes-Benz’s stoic G-Class, is about to get a whole lot tougher with the arrival of the new G550 4×4² variant. The boxy off-roader has been confirmed for sale in the United States as a 2017 model. It arrives early next year and will be sold alongside existing G-Class variants such as the G550 plus Mercedes-AMG’s performance-oriented G63 and G65. It’s been on sale elsewhere since last September. The G550 4×4², first previewed as a thinly-veiled concept at the 2015 Geneva Motor Show, takes the hardware of the insane G63 6×6 and shoehorns it into the regular G-Class body. 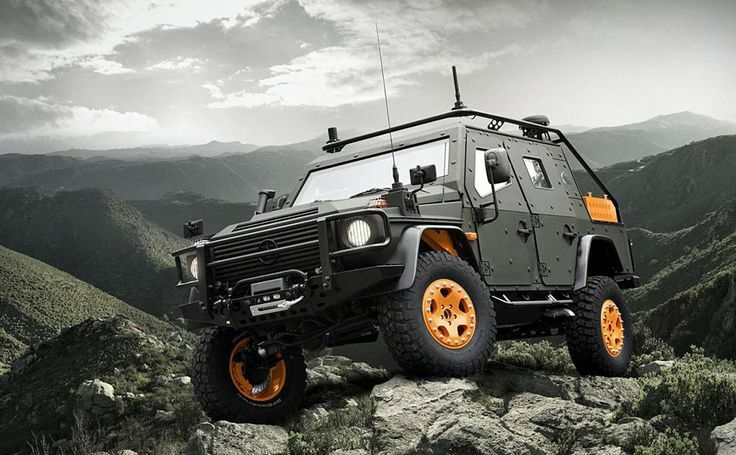 The result is a G-Class with a much taller ride height (now over 17 inches), permanent all-wheel drive, reduction transfer case, three differential locks, and of course the portal axles. The latter is what contributes to the raised height: unlike conventional axles, the wheels, in this case a massive 22-in set, are not at the height of the axle but situated lower thanks to their individual portal transmissions. In addition to making the vehicle higher, portal axles also increase the width. The width of the G550 4×4² is up more than 9.0 in at the front and 10 at the rear. The suspension includes damper struts and dual springs that have a high rate of travel to maximize surface contact even on the toughest terrain. And adjustable-damping shocks are aided by two stabilizer bars to ensure the vehicle remains compliant when on the tarmac. Power comes from the same twin-turbocharged 4.0-liter found in the regular G550. It’s mated to a 7-speed automatic transmission and is rated at 416 horsepower and 450 pound-feet of torque. All-wheel drive with 50:50 torque distribution between the axles and a low-range mode is standard. Although we’re talking about a vehicle aimed at buyers in love with the great outdoors, the cabin of the G550 4×4², like most G-Classes, is luxurious and well-appointed. For the 2017 model year, all G-Class variants get an updated infotainment system with a new 8.0-inch display screen as well as extra connectivity options including Apple CarPlay and Android Auto smartphone integration. Mercedes hasn’t announced pricing but we expect the G550 4×4² to be positioned between the G63 and G65 models, which for 2016 were priced from $140,825 and $220,825, respectively, with shipping.